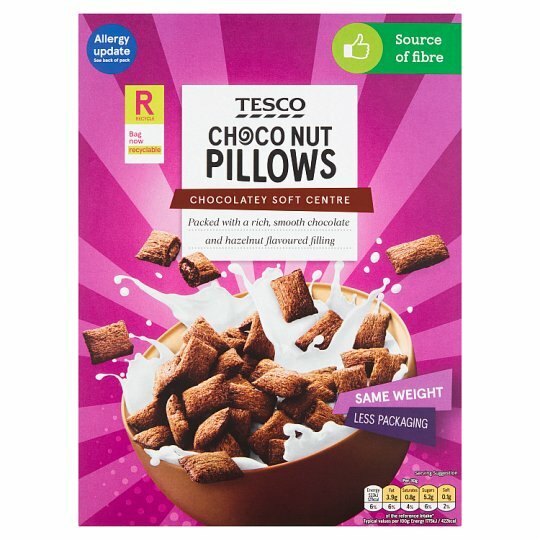 Cereal pillows with chocolate and hazelnut filling with added vitamins and iron. Chocolatey Soft Centre Carefully selected grains. We love brekkie that's why we carefully select the best ingredients for your bowl. We make sure it's packed full of vitamins and tasty as can be so you're ready for the day ahead. INGREDIENTS: Chocolate And Hazelnut Filling (35%) [Sugar, Rapeseed Oil, Palm Oil, Fat Reduced Cocoa Powder, Chocolate [Cocoa Mass, Sugar, Fat Reduced Cocoa Powder], Hazelnut, Emulsifier (Sunflower Lecithins), Flavouring], Rice Flour, Wheat Flour [Wheat Flour, Calcium Carbonate, Iron, Niacin, Thiamin], Oat Flour, Maize, Fat Reduced Cocoa Powder, Sugar, Salt, Sunflower Oil, Emulsifiers (Sunflower Lecithins), Sugar Syrup Powder, Iron, Vitamin E, Niacin, Pantothenic Acid, Vitamin B12, Vitamin D, Thiamin, Folic Acid, Riboflavin, Vitamin B6. May contain milk. Also, may contain peanuts, other nuts and milk. For allergens, including cereals containing gluten, see ingredients in bold.